One of the more perplexing announcements to come out of Microsoft’s Surface hardware event in New York City yesterday was the port choice across its refreshed Surface laptop line and its new, noise-cancelling and Cortana-equipped Surface Headphones. On the wireless Surface Headphones, which are a forward-looking pair of high-end cans designed to compete with Bose and Sony, you have a USB-C port for charging. You’ll also find USB-C on the Surface Go and on the just-announced Surface Studio 2. Yet on the Surface Laptop 2 and Surface Pro 6, you’re still stuck Microsoft’s proprietary Surface Connect charging port and mini DisplayPort. It’s become common after tech industry hardware events to gripe about port choice these last couple of years, ever since Apple ditched the headphone jack. But with regard to USB-C, it’s starting to become inexcusable that tech companies — those that promise the future now and yet deliver a product with one foot in the past — are making customers’ lives more difficult and cumbersome by refusing to integrate new, more modern standards for reasons that are not readily apparent. Back in 2017, Microsoft’s general manager of Surface Engineering, Pete Kyriacou, explained why it wasn’t including USB-C in its devices. He cited unreliable hubs and consumer confusion over chargers as primary motivators for avoiding the port. But he also added that “when Type-C is ready for our customers, to make it easy for them, we’ll be there.” Since then, some of those problems have been mitigated (though not, I will admit, entirely solved). While it’s still relatively common to find gadgets from lesser-known companies still using MicroUSB or proprietary charging ports, Microsoft finds itself increasingly in the minority here. The Nintendo Switch uses USB-C, as does pretty much every major Android smartphone (for years). The best Bluetooth headphones from Sony, Bowers & Wilkens, and others? They all use USB-C too, albeit with a few major exceptions that could hinder the wireless headphone category’s USB-C adoption. A number of popular portable Bluetooth speakers (except the new Ultimate Ears Boom 3 and MegaBoom 3) are integrating USB-C, or plan to in models coming out later this year. The point is that USB-C could be a universal charging standard, and yet companies like Microsoft are holding it back. Microsoft’s justification from last year may hold true, but one way to fix the problem is to embrace USB-C on its products. The more devices that use USB-C, the more compatible (and reliable) accessories we’ll get. Of course, you can’t have this discussion without mentioning the sleek, aluminum elephant in the room: Apple. It moved the entire MacBook lineup to USB and though we all have complained about dongles for years now, directly-compatible cables and accessories are beginning to emerge. Other PC makers — from Google to HP to Samsung — have followed suit. But then there’s the iPhone and iPad, which still use the proprietary Lightning port instead of switching to USB-C. The port is going strong now three years later, on the iPhone XS, XS Max, and XR. Apple’s justifications for keeping its iOS devices off USB might also ring hollow to some, but they’re at least grounded in the physical necessities of these thin devices (plus whatever benefit Apple gains from controlling the Lightning ecosystem via its MFI program). 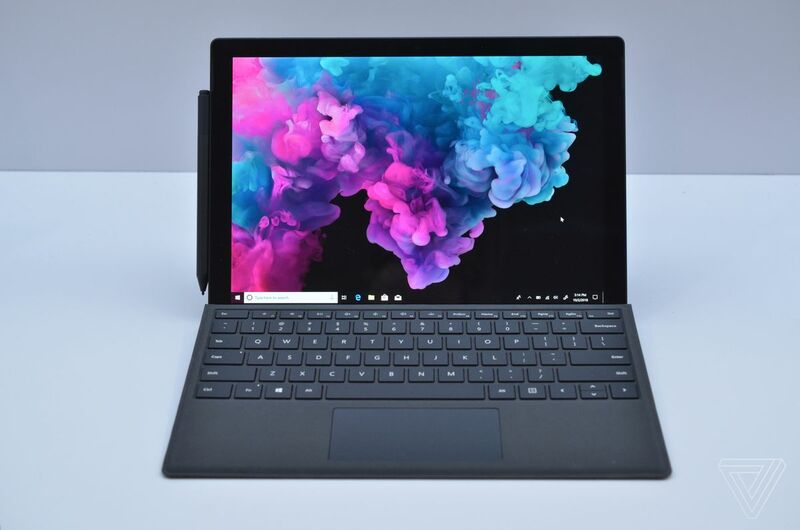 That brings us back to Microsoft, and just why its new top-of-the-line Surface devices still do not use USB-C. Not using it for power and basic docking could make sense — after all, the Surface Connector is in many ways superior to USB-C. The Connector attaches magnetically and works with Microsoft’s own line of docks. But refusing to swap out the mini DisplayPort for USB-C is beginning to look less like a design decision to maximize compatibility and more like obstinance. his standard infectious fervor yesterday — is actively trying to thwart customers from achieving a more efficient workflow. There’s probably a reasonable explanation for why the devices don’t have new ports, and it’s likely related to how the chassis of the device is designed. Given that these devices predominantly feature superior innards and a new, matte black color scheme, it’s reasonable to assume Microsoft felt like it could not or didn’t need to completely revamp the underlying manufacturing and industrial design processes for the Surface Pro 6 and Surface Laptop 2 just to bring the ports up to speed. Although Microsoft didn’t explicitly say this was the reason it’s not going with USB-C, the company implied in an interview withThe Vergeafter the event that its priority was in keeping the same design and thinness. Back in 2017, Kyriacou said, “I think [USB-C] has a little ways to go before it goes totally mainstream.” Yet it’s beginning to look like Microsoft isn’t all that interested in helping to make that happen.